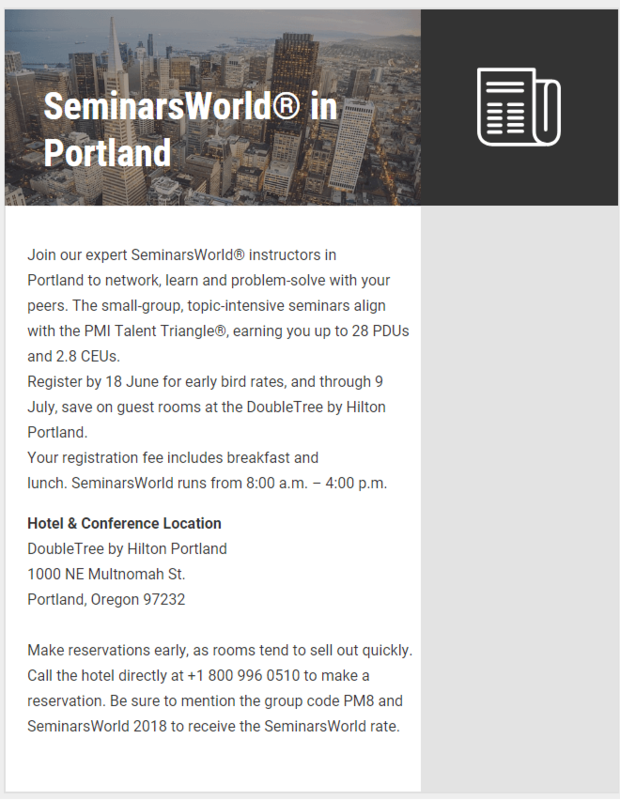 Join our expert SeminarsWorld in Portland to network and learn with your peers in small-group, topic-intensive seminars aligned with the PMI Talent Triangle®, while you earn up to 28 PDUs and 2.8 Continuing Education Units (CEUs). Register by 18 June for early bird rates, and through 29 July, save on guest rooms at the DoubleTree by Hilton Portland. Make reservations early, as rooms tend to sell out quickly. Call the hotel directly at +1 800 996 0510 to make a reservation. Be sure to mention the group code PM8 and SeminarsWorld 2018 to receive the SeminarsWorld rate. For online reservations, click on the “book your room” button.